One in every two people rate the experience of finding an aged care home for a loved one as “extremely stressful” or “very stressful”, with more than three-quarters of respondents reporting moderate or higher stress levels*. This is the alarming revelation of a recent survey into aged care entry conducted by senior’s insurance agency, Apia. Amplifying the stress felt by families is the length of time taken to find a suitable aged care home. More than half of respondents (56%) reported taking more than a month to find the right place. Some people reported taking 2-3 years and others said that their loved one had moved from place to place a number of times before settling. Given that families seeking aged care are already experiencing intense emotions, David believes it is little wonder that many of them make decisions that don’t result in the best financial outcome for their loved one. “People simply don’t have the right information available to them, and it can cost people thousands of dollars in extra fees, lost income or both,” he says. While finding an aged care home can be complex and stressful, it doesn’t need to be. The experts at Senexus lead you through the aged care process to find the right aged care home and determine the best financial outcome for your loved one. 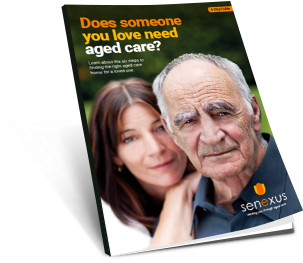 To learn more about how Senexus can relieve you of the stress of finding aged care for your loved one please call 8344 1991. *Apia, The Great Australian Aged Care Entry Survey 2016: How Australians choose an aged care facility for themselves or their loved ones, (April 2016). Does someone you love need aged care? Learn about the six steps to finding the right aged care home for a loved one.